By the PC, I am referring to desk based systems that primarily use Microsoft Windows and although it could include Macs, that is another story for another time. The thing here is to see that the rise of tablets as seen a fall of PCs especially in terms of the home computer. While in business, a desk based system on some kind will always be required, for most families, especially for children and those not used to computers, tablets can now easily meet all their requirements. 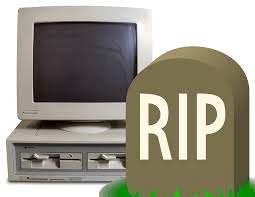 As well as the attraction to tablets, the death of a PC has also been because of Microsoft’s Windows 8, which has been an universal flop to say the least. I could never get my head this hybrid mess and it is what convinced me to purchased a Mac and retire my PC. I can see the sow collapse of Microsoft as the PC sales continue to fall. It is important to realise everything has a beginning, middle and an end and this is the end for the PC.